Unit 24 lot 112; TOT ID# 1607. This is an ocean meadow home that features panoramic blue water views from across the meadow and has two bedrooms two baths and a loft. 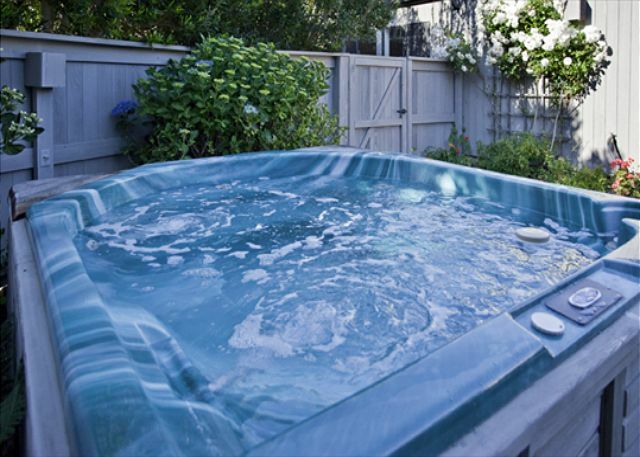 Relax in the hot tub surrounded by a private garden. Take a short walk to nearby Shell Beach or continue on the Bluff Trail to enjoy the unique Sea Ranch area scenery. Free wireless internet. Bed linens and towels are not included with this rental. I think we have found a winner! Clean, efficient, well lite and with a wood burning stove and hot tub. Location, meadow/ocean view, home layout and furnishings was also very pleasing. We had a wonderfully quiet and restful 4 day stay. wild stands of trees, respect for nature in the face of a development. restart the pilot light for that heater when we called but we were cold a lot there...luckily great thick quilts and blankets were plentiful. We loved the 2 wings/each with a bedroom and the loft for my mattress. Well designed home. This was the perfect place to celebrate a major birthday with my family. Plenty of room for 2 adults and one toddler. 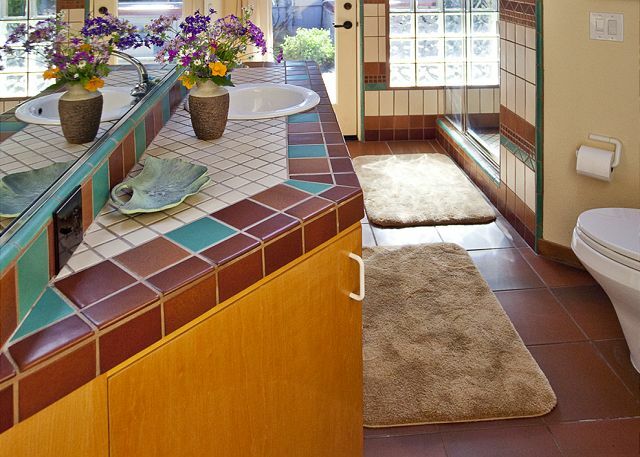 We enjoyed the colorful gardens, ocean views, and wildlife surrounding this rental home. Our weather was unexpectedly bright sunshine every day. The hot tub was a welcome relief after hiking the nearby bluff trails. The baby loved watching the many deer prancing in the meadow nearly constantly. Love the window seats and views of the soaring hawks from the loft. The layout of the kitchen was big enough for everyone to help prepare meals. Nice to have two sinks! The skylight in the second bedroom did drip onto one of our guests one night...from we found that keeping a window open for ventilation helped slow the drip. So nice to be able to park one car in the garage. We would definitely stay again....for longer than 4 days. Great views, ambience, gardens, location and creature comforts. Couldn’t ask for more. We loved our stay. The house is well appointed and ever so comfortable! The kitchen is well-stocked with anything you could need. The ocean view from the patio is beautiful and the stars at night were spectacular! The hot tub was a lovely bonus and very welcome after all the walking we did on miles of the Bluff Trail. It was a perfect location for a long weekend with the family. The weather cooperated to give us sunny days. The families of deer settled in on our yard, and the view was wonderful. We love this area because it is a short walk to the beach. The house was well laid out with room for everyone. The window seat was very popular with everyone! The kitchen was well stocked with eveything we needed to enjoy some nice meals. One afternoon we got some BBQ tri-tip from the Surf Market, a family tradition. We took it to Shell Beach and enjoyed dinner with a sunset and our friendly harbor seals. I highly recommend this house. Just a great house for a small family or a couple who wants to invite a few friends for rest and relaxation. Located near the seal rookery and beach on the meadow. Hot tub and private yard is a real plus. House is well designed and comfortable. The location of the home was perfect for us - easy access to the beach & tidal pools, whales & harbor seal viewing long walks, playground for the children, etc. The home had a well equipped kitchen and quite comfortable. The management company was excellent - friendly and accommodating! We had a lovely, relaxing dinner at the "lodge"- our server & the staff accommodated our large family with ease in the casual dining area ( 6 adults & 6 children.) The food & service was wonderful!! We have already recommended Sea Ranch & the management co. to several friends and plan to return! For me there is no better place to escape to re-charge my batteries. This year my family was able to squeeze in a few days stay before Christmas. 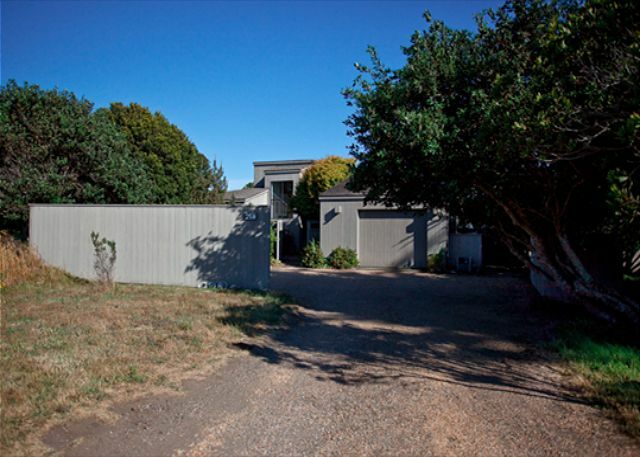 This house has beautiful ocean views and is steps away from my favorite section of Sea Ranch trails. This trip we hiked the trails to Whale Point near Gualala and climbed to the top of the Pt. Arena Lighthouse to watch the whales play. The kitchen is well stocked. We had fun baking Christmas cookies next to a roaring fire. I highly recommend this house whose open layout in the main area of the house encourages spending time together. We had a wonderful stay. The house is quite close to the Bluff Trail. House is full of sunlight and beautiful both during the day and at night. The kitchen is quite well stocked and easy to cook in. The only negative thing I have to say is that the heating went out and the first couple of mornings we were there were cold. Beach rentals got a plumber out there the first day but it took a couple days to get things fixed. We loved the Brown Hansen house for many reasons. The location is our favorite at Sea Ranch. It is a short walk to the bluff trail and the view is spectacular. 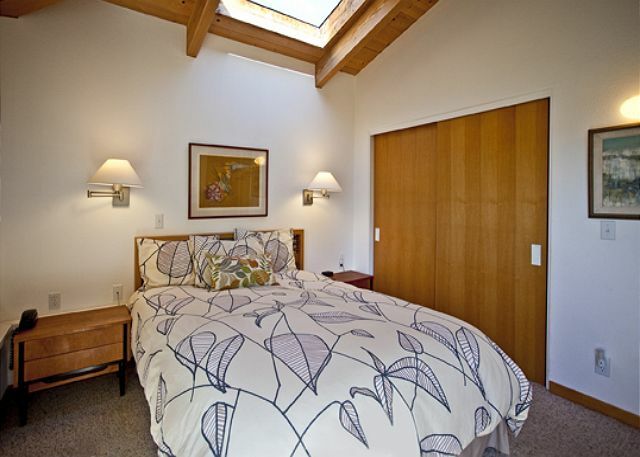 In the past we have rented other homes in this location and found this home to be very cozy and comfortable. The landscaping and outdoor patio and courtyard are beautiful. We kept the birdbath clean and full of fresh water and were rewarded by visits from wildlife every day. The bed was comfortable and the kitchen was well stocked with everything we needed to prepare meals. The weather was so perfect we ate every single meal outside on the patio and thoroughly enjoyed the sweeping ocean view. Lovely house that was perfect for our small family. Loved the visiting wildlife (fox, deer, birds, seals), the accessibility to the under-populated beach, the *silence* (quiet, quiet, quiet!) that allowed us to hear only the sounds of nature and the *clean*, functional and cozy accommodations! This was our first Sea Ranch vacation; we will now do this as often as possible. We have been coming to The Sea Ranch for over 30 years and it is always the most relaxing vacation. The Brown-Hansen house was wonderful. 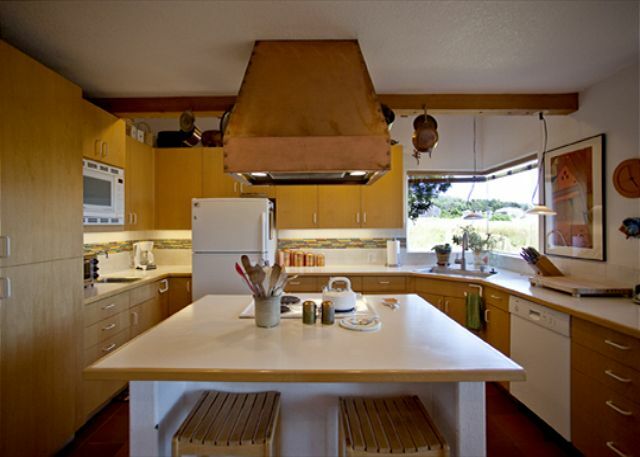 The kitchen was well-outfitted with lots of dishware and other cooking items. They had lots of books to choose from if you wanted to read. It was close to bluff and meadow walks and had fairly close access to beaches. The hot tub was quaintly surrounded by a protected garden teaming with flowers. There was lots of wildlife to enjoy with deer, foxes, hummingbirds,hawks and even a visiting skunk. The design of the house easily allows two suite-like sides of the home so it is perfect for two couples, although the loft with the extra TV would allow a space for youth to hangout. We had a fabulous time cooking, walking, playing games, reading, watching movies, and of course animal watching and relaxing just watching the meadow and the blue-water view. We liked that it was smok-free and pet-free. Two negatives - the beds were on the hard side and there isn't a sunset view. Otherwise, we loved it and would rent this home again. We had such a good weeklong stay celebrating my 40th birthday with our three young daughters at Brown-Hansen. It's a 5-minute walk to Shell Beach and Tide Pool Beach. It's also a very short drive to Gualala. We took a couple day trips to Gualala Point Regional park and the girls had a blast searching for driftwood on the beach there. Don't be afraid to bring groceries along. The home has a well-stocked kitchen, which we used to cook all but 2 of our meals. The home is beautiful and yet cozy and comfortable (i.e. we didn't have the sense that our young children were going to break something expensive at any minute). We chose Cove Azul for my bday dinner. If I had it to do again, I would have gone to Trinks. We had lunch there and we really enjoyed the food and vibe there. We had one problem with the central heating and called the property managers who were professional and apologetic. Within ten minutes, the owners Bob and Sue had called us and helped us get it resolved. Really kind people. This is the second time we've rented this house; we came back because of the excellent location, views from the patio, wonderful garden & hot tub, and nicely furnished & equipped home. We loved it! This was the third time we rented this house. We noticed a few changes. The upstairs TV was replaced with a flat screen one. There are new pots and pans. The garbage area was decluttered. We saw our usual favorite animals: deer, a fox, a black cat, lots of hummingbirds. The weather wasn't in our favor but as always, we enjoyed living in this home. Location is great. Close to Gualala. Bluff trail right outside the front and back entrance. We look forward to our stay at this house every year ... and this year was no disappointment! Beautiful weather, flowers in bloom, deer everywhere (and an albino fawn! ), lots of birds, and sunny warm weather. We've been coming to Sea Ranch with ourkids for over 10 years and have stayed at Brown Hanson four or five times. It is just the right mix of casual while also having everything you need. Some of the rentals we stayed in our so sparsely furnished and have so few kitchen utensils it feels like the Grinch was there before us. 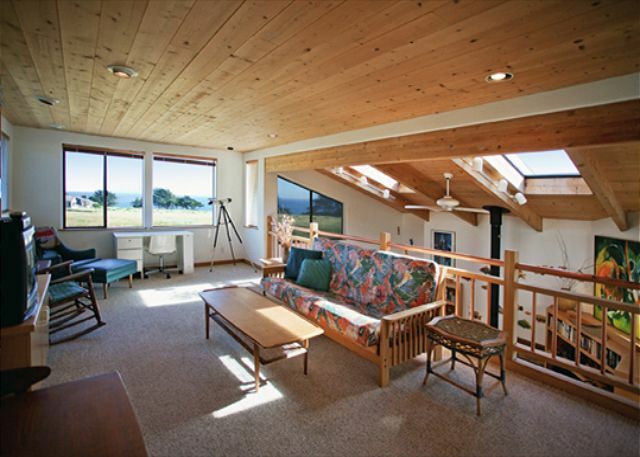 Brown-Hansen immediately welcomes you and makes you feel comfortable whether you are staying a few days or few weeks. We love it. 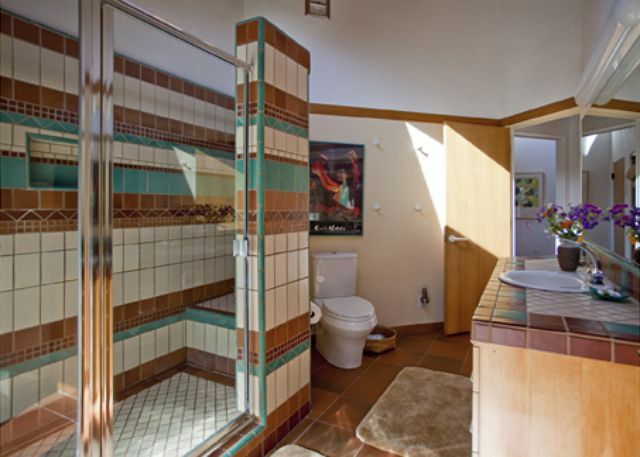 This property is clean, well-equipped, colorful, comfortable. Easy walk to beach, nice patio for dining. Comfortable and warm. Lovely courtyard. Good upgrades. 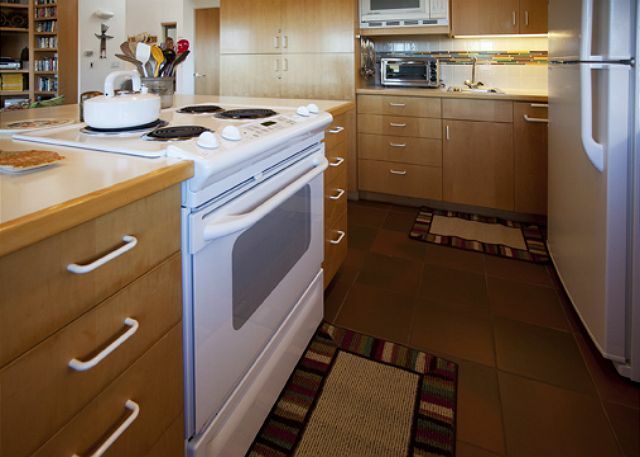 Impressed with well equipped kitchen, pots, pans, utensils, etc. Washer/Dryer was excellent. Lighting was plentiful and no burned out bulbs. Relatively private location. Hot tub well maintained, and private. Garage was available. Loft was a very nice bonus. Wi Fi was reliable as was the Direct TV. 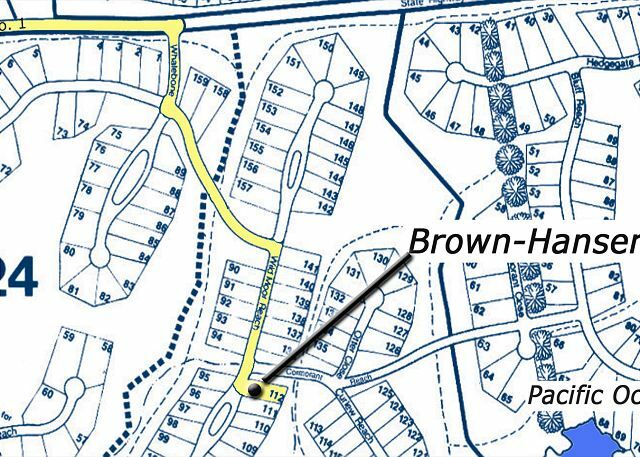 Good location next to biking,mailing and immediate trail access. 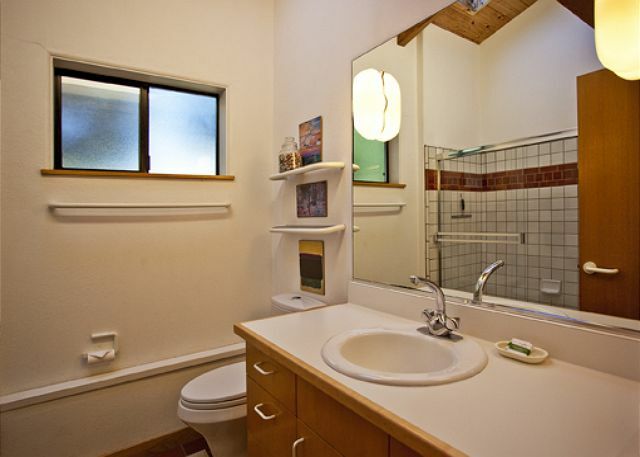 Bathrooms well maintained and clean. Deer everywhere. Truly enjoyable experience. We rented this great home for a family Christmas Holiday. We were travelling from Philadelphia and rented the house never having seen it before. Our adult children, who live in Napa and San Francisco, joined us there for the week. The Rental Agency Staff performed solidly. Good advice was given via phone and emails. The home was wonderful. Great views. First class design, architecture, and appointments. Superb kitchen. MCM furniture was nice quality and comfortable. Homey, too. Beds were comfortable. First rate outside areas, landscaping. The house was clean and it was well maintained. Needless to say, we had a great time at The Sea Ranch. We would certainly rent this home again and thank the owners for making it available to us. We had a lovely week with friends. The house functioned well, and the weather was mostly beautiful. We have rented this house many times and always enjoy being here. Overall a beautiful home; wonderful gardens, great spa, ocean views from a restful patio, roomy house with fun loft/game room, lots of different lighting options. We had a great stay. For future guests we would recommend bringing your own cooking spices and plastic bags/foil as the kitchen didn't have these. There are reasons why we've driven over 800 miles from our home to stay at the Brown-Hansen house about eight times over the past decade or so--it's a wonderful, comfortable house in a great location in The Sea Ranch; the décor and furnishings are very nice; the private garden with hot tub is amazing; and everything is spotlessly clean, well-equipped and well-maintained. We've enjoyed every single minute there, and plan to return! 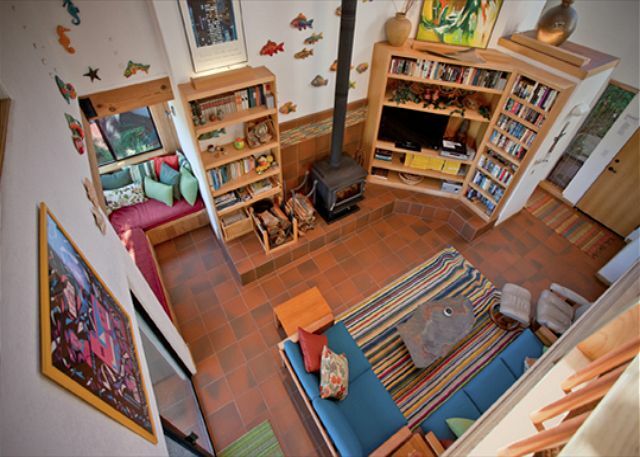 Lovely home, lots of smaller nooks to read a book or play a game, while still being part of the main room. The birdbath attracted bluejays, while the garden hosted hummingbirds, deer, bunnies and even a fox. This was our second stay in Brown-Hansen, the last was in 2003 and the house has held up beautifully. Well stocked with cookware, the kitchen is a great place to cook a meal wile you enjoy the beautiful serene views out the many windows that face the meadow. Out those windows we saw much wildlife, including deer, fox, bats and many birds. The only drawback to our stay in the home was the very sticky front gate. Otherwise lovely house. Great for families. Each yearly pilgrimage to Sea Ranch we stay at Brown Hanson. Perfect place for access to the ocean, running trails, and relaxation. Thanks again for letting us share the wonderful house! I was very happy that the kitchen was well stocked. Loved the location...One minor improvement would a better mattress for the 2nd bedroom (one similar to the master bedroom matress). We had a wonderful time in this perfectly located house. It was just a few minutes walk to the cliff side trail. 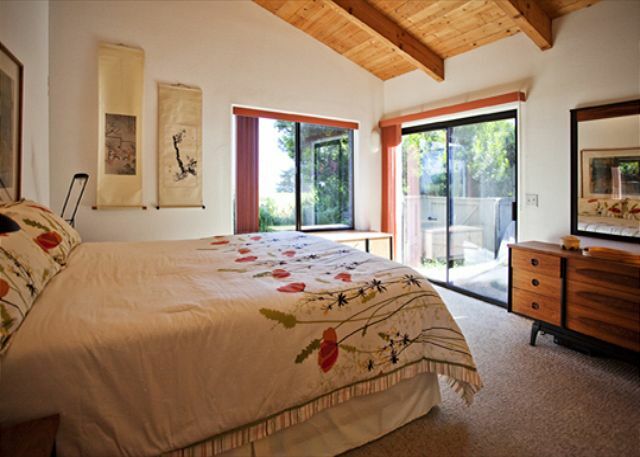 The carefully designed and furnished house afforded the five of us great privacy and great shared time. We love to cook and were delighted to find everything that we needed to prepare our meals. The wildlife was especially active during this trip. We sighted many deer, harbor seals and their pups, as well as, a bobcat and an oyster catcher. Just perfect. The home lay-out, the kitchen equipment, the meadow location: all great for our one week vacation. Great House (exactly what we expected, delivered to us in spotless condition). Great Place (view and landscaping just as advertised). Can't wait to come back. Sea Ranch is an amazing, beautiful, relaxing place. A group of 21 of us enjoyed every moment of our visit to beautiful Sea Ranch. As always the homes are nothing but the best for comfort, style, and views. Having rented 3 homes during this visit and dealing with the Vacation Rentals office who were also very accommodating to all our needs. The Brown-Hansen home is well worth a return visit. We first stayed at Brown-Hansen about 10 years ago and not much has changed--which is good. The home is well appointed and spacious. 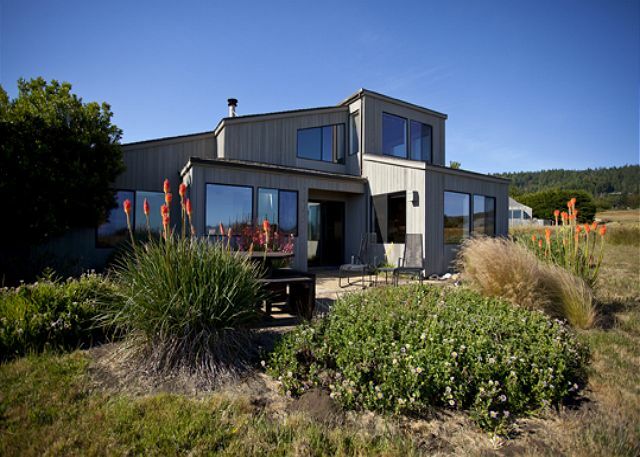 It differs from other homes we've stayed at in The Sea Ranch in that the owners are comfortable sharing their art, comfortable furnishings and quality beds with guests. Other homes we've stayed in lack the personal touch that Brown-Hansen offers. This very comfortable home is perfect for a couple or small family. 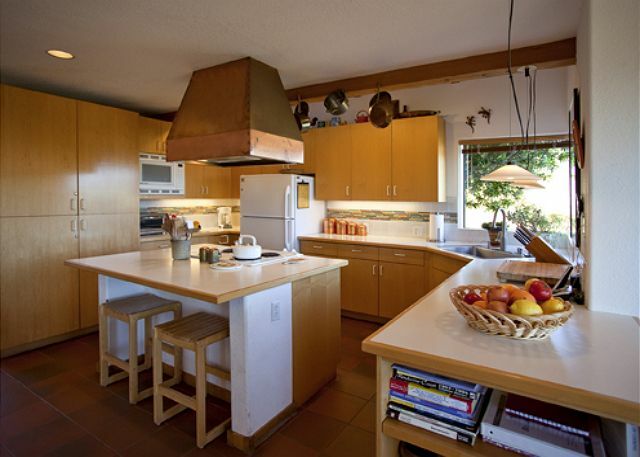 Near hiking trails and situated on the sea ranch meadow a short walk from Shell Beach and tide pools.Secluded side yard with a hot tub is a definite plus. 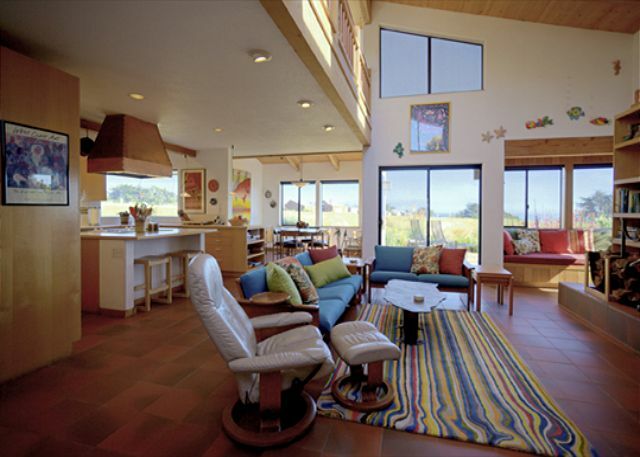 If you like decoration with a southwestern flair this house will appeal to you. Beach Rentals is a first rate property rental company with very friendly and competent staff. 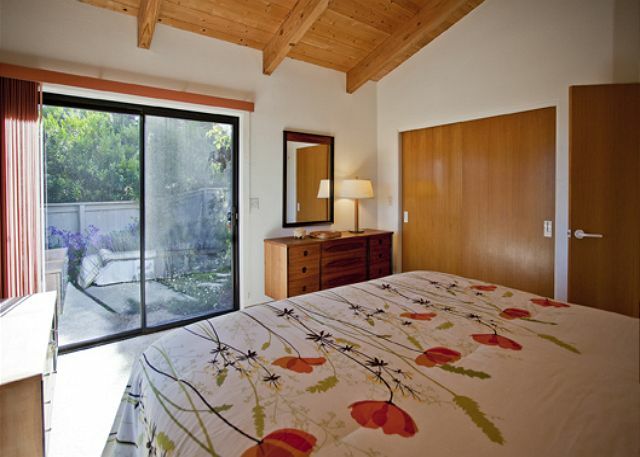 This home is very well equipped just bring your linens and towels and prepare to relax!! We love staying at Brown-Hansen on our yearly trip to the northern California coast. Views were great, flowers were out, whales were spouting ... it just doesn't get better! We had a fabulous vacation, we have been coming to Sea Ranch for 34 years. My only complaint was the sofas are not very comfortable. We loved the house! 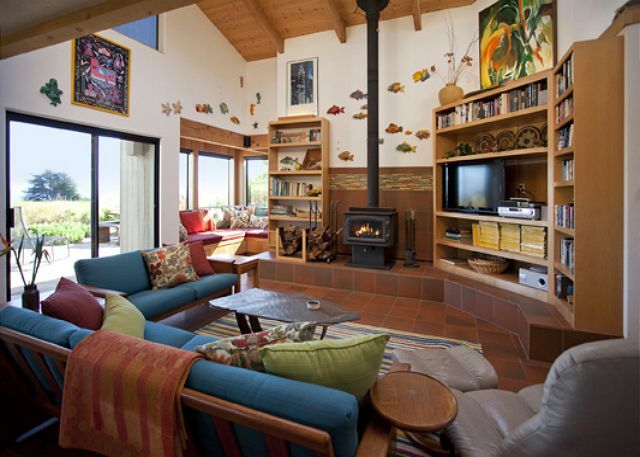 The colorful furnishings, lovely art work, and lots of windows made the home cheery and welcoming. We appreciated the fully stocked kitchen - plenty of plates, glasses, and pots and pans for cooking. We will definitely rent this home again. We had such a wonderful stay. The house was so comfortable and kitchen was well stocked. The courtyard front and back were absolutely lovely! We are looking forward to staying there again! Thank you so much for the use of your home!! 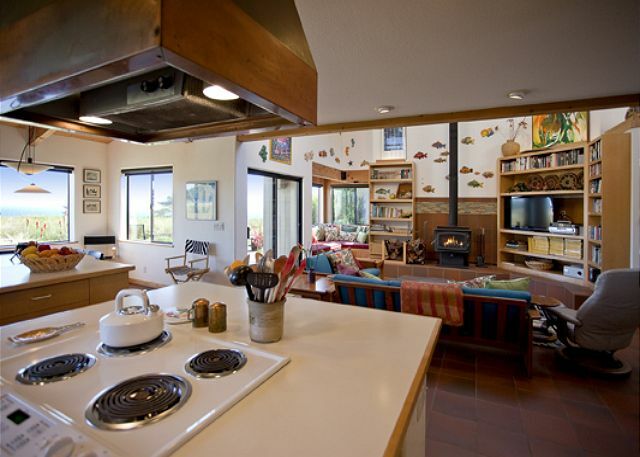 This was one of four homes rented for a family gathering in The Sea Ranch. This home was clean, comfortable and well-equipped. The home featured two beautifully landscaped courtyards. The location was perfect and close to the beach. We really enjoyed our stay. Thank you, Beach Rentals! We had a wonderful week at this house. It was very comfortable for my family and we will definitely be back. We loved Brown-Hansen House at Sea Ranch. We liked the layout so the kids were on one side of the house. The hot tub got a lot of use! Only a few minutes walk to shell Beach. We loved seeing the deer right outside. 100s of books were there, we brought our own but it was a nice addition. It would be nice if there was a propane BBQ but we made it through with the Weber! The only other need would be some new knives so if you cook a lot and need to cut you might want to bring your own. We will probably rent again every year!! We were all thrilled with our stay, especially our black lab, Gracie. We celebrated her 9th birthday at Sea Ranch where she played in the ocean and chased deer ... her favorite things. Every detail at the Brown-Hansen house was just right. The sunny window seat is a booklover's dream. WOW! Loved every minute in this lovely home. Well stocked kitchen for cooking. Well designed home for maximum enjoyment. Spent many hours at the reading nook gazing at deer, the ocean, the blue skies and then some actual reading. Great walks. Their beautiful flower garden was an added bonus. Well appointed, fully stocked and thoughtful touches throughout property. Loved the doggy welcome! This property is at a great location to beach, bluff and other trails. The back patio is out of the wind and a great place to hang out. The layout of the house works really well to have several people stay there. Everything was lovely and well maintained. Definitely a place to return to again and again! One of the perks was being able to bring the dog with us. Our two teenagers enjoyed the house, trails, and beaches as much as we did. Driving up and seeing deer on and around the property was exciting. Thank you for the opportunity to stay!! The Biggs family and Boone, the dog! In a nutshell: this is a great house to rent. We speak from experience as we have rented at least 30 different houses at TSR over the past 14 years. This house is definitely in the top five. Besides being well appointed and very comfortable, it is in a great, wind protected location (we ate breakfast in our shorts on the back patio in Feb.) that is within walking distance of the seal rookery, and the Olsen rec center. Easy to ride your bike from. Wife loved the kitchen. Only minor gripe was hot tub motor ran too much-staff is looking into that and I am sure it will be fixed before the next renters check in. Great winter storm experience, from the hot tub; also relaxing on the window seat near the wood stove. Our Bouvier des Flanders dogs, Gabi and Max, enjoyed the sheep herd out the front door, grazing in the open fields & walking w/us on the trails through Sea Ranch - a very special place. House is spacious for several people, or cozy for just two (+ 2 pups). Splendid views of the ocean and meadow . Thx for the experience! Loved the location - very close to the beach. Loved the place - very lovely and spacious. The sound system was not the best but that was the only thing I was slightly sad. Everything else was great including a nice hot tube and an awesome shower. Would rent again. Twice each year another couple has joined us at Brown Hansen house for the last 13 years. 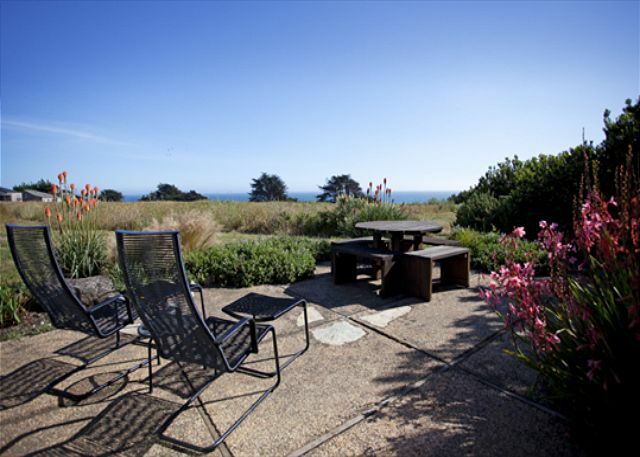 The location is perfect - within minutes of Gualala, the ocean hiking trail and little more than an hour from Mendocino. The house is attractive, comfortable and welcoming. Views of the ocean and outdoor seating with view of deer eating close to our kitchen window. A real winner. Good communication from the property management firm as relates to reservations and check-in package; directions, etc. Lovely home with a great location! 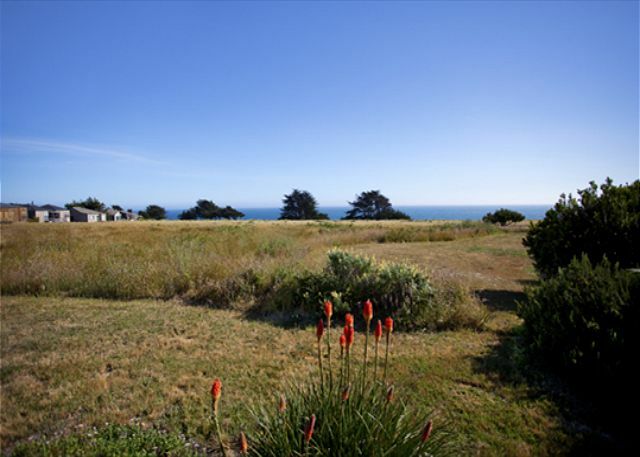 This house has a lovely view of the meadow and is very close to the Shell Beach trail. This beach seems to be a little quieter than ones further north. The rooms are comfortable and the kitchen is very well equipped- if anything it could use a little editing. We love to cook and had everything we needed, including a working barbecue. The house is surrounded by hummingbirds and bluejays and there were lots of deer grazing nearby at all hours. A very restful and beautiful spot. Also it was perfect for our dog who could lounge around outside in the courtyard or in the garden without having to worry about her wandering off. We will definitely be back. We have stayed at the Brown-Hansen house many, many times. It is perfect in every way-ambiance, comfort, so well-equipped, location. 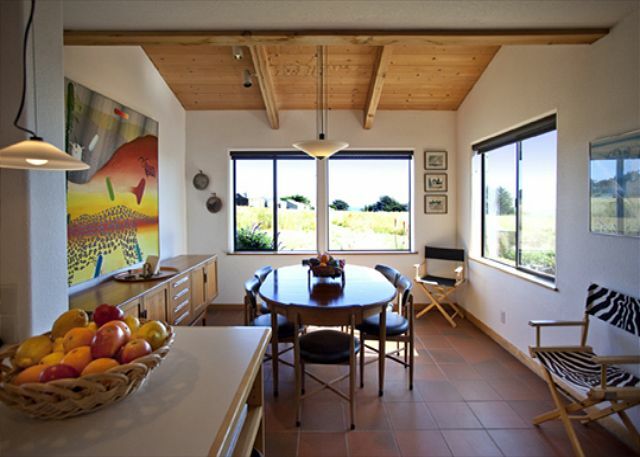 We have stayed at many Sea Ranch homes over the years; this house has long been one of our very favorites. We really enjoyed the house, the amenities, and the location. We would definitely return and stay in this house. The yard for your dog was a plus, and the kitchen also comes well equipped. Fantastic place - the pictures on line do not do it justice. Very beautiful, comfortable, well equipped home. We will definitely be back. We have stayed in many different houses in Sea Ranch, and I have to say that this one was in the top two--it would have won first place had we had more of an ocean view. The living room is cozy, yet spacious (everything was absolutely spotless as well! ), the kitchen is very well equipped for cooking simple to elaborate meals, and the garden was absolutely beautiful, and private as well. We will definitely be back to stay at this property again, and we hope that is very soon! This house has it all: great location, comfortable, relaxing, well-equipped. Positives: The house has a well equiped kitchen and an open floor plan so good for a family with a dog. Great view of a variety of wildlife from the dining room/kitchen and upstairs loft. One of the cleanest homes I've rented. Loves the tile floor in the main areas. Cons: Check kitchen pots/pans dishes. The guests before us put them away dirty. That was gross. The blender was leaking oil so we has to throw it out - time for a new blender. Minimal privacy those staying in the loft. Overall has a great experience. Such a wonderful, relaxing place to stay! Clean and welcoming, with all the amenities to make your stay comfortable. Enjoy! My favorite house @ sea ranch. We've stayed @ sea ranch for many years. this was by far the cleanest, easiest, and most modern home we've stayed in. A great location close to shell beach and the house is also very pet friendly! We loved it! As always we thoroughly enjoyed our visit and the home. We have already shared about the lights, TV, and no flashlights. We did, however, truly appreciate the prompt response by Beach Rentals and the owners regarding our issues. The prompt response was very much appreciated and we will look forward to staying at Brown-Hansen again soon. staying in a house for the first time always has some anxieties especially for the girls on thanksgiving. this house answered all their questions easilt, plenty of kitchen room, table seating ,oven size, utencils, everything i couldn't care about. however once you make them happy it makes for a great vacation. great views, easy walk to the beach, everything was perfect. if available we will be back next year. 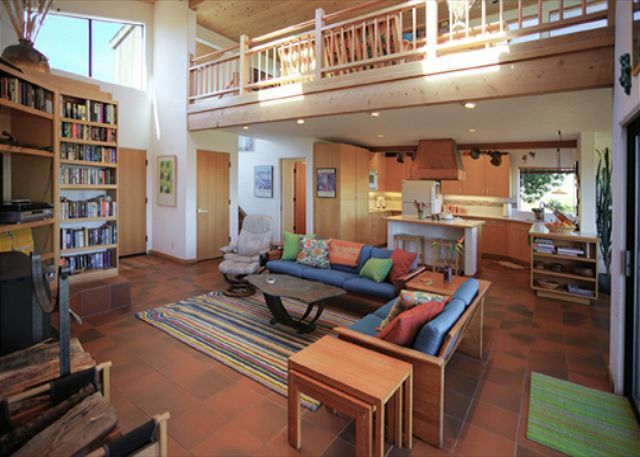 The most perfect Sea Ranch house!!! We have rented this house at least annually for over ten years. It is delightful in so many ways: great location and views, well-equipped and well-maintained, so comfortable. The gardens are a lovely bonus, too! Brown-Hanson always pleases ... it's convenient location near the water, the wildlife both in the meadow and on the shore, the clean spacious house, and of course the relaxing jacuzzi ... this always makes for a wonderful stay. Thanks again for sharing your house. From start to finish, our experience was very positive! The property management team were professional, kind, and resourceful, and willing to answer all questions asked. The beach rental was amazing! It was perfect in every way: beautiful view, great ambience in the home, and well stocked with household supplies. We didn't want for anything and we truly felt that we had a resting and relaxing vacation. Thank you! My two teenagers and I stayed at the Brown-Hansen house over part of spring break. 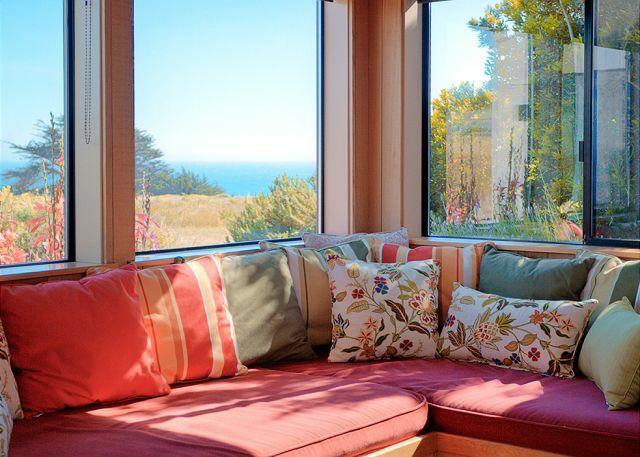 It's probably our 10th trip to Sea Ranch and this home and location were wonderful. Easy walking distance to a nice beach and a gorgeous view from the house. the kitchen was well equipped, the garden by the hot tub was beautiful and relaxing and the wireless Internet a big hit with the teens. Hi, We love this house and have stayed there a bunch in the past...everything was great but the hot tub. It needs some work. It wasn't getting hot enough (staying at around 93 to 95 degrees). Thank you for your comments about the hot tub. It has been repaired. It is a very well stocked house. Love the open floor plan. Gardens are lovely and great ocean views!